The pulmonary venous abnormalities are very rare and are difficult to diagnose. We present a case of middle age male who presented with cough and chest pain. Chest radiograph showed abnormal tortuous vessel in right lung. Computed tomographic angiography of chest demonstrated meandering anomalous right superior pulmonary vein. Congenital anomalies of the pulmonary veins are rare. ,, Pseudo-Scimitar syndrome or "Meandering" tortuous right superior pulmonary vein means an anomalous course of the vessel which may not be the sole draining vessel of the ipsilateral lung. It is a very rare entity and can be wrongly labeled as scimitar syndrome or arteriovenous malformations, which can lead to unnecessary surgery. Computed tomographic angiography (CTA) of chest is very useful imaging modality to establish the diagnosis of anomalous vein along with excellent depiction of the anatomy and unnecessary intervention or surgery can be avoided. A 30-year-old man presented with a history of cough and chest pain for two months. 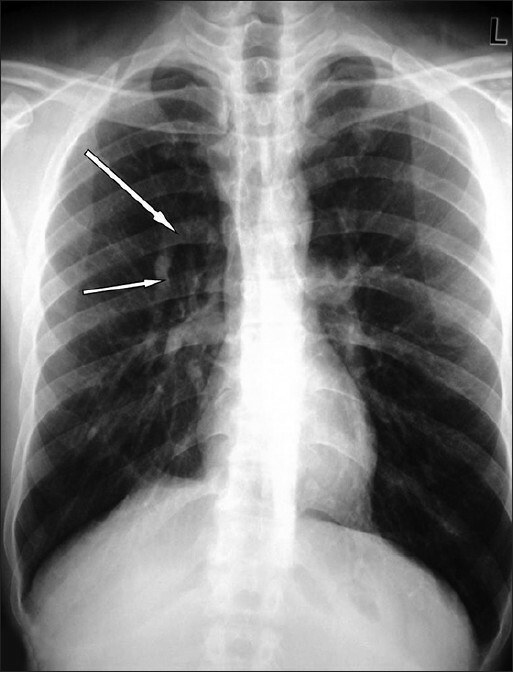 Chest radiograph [Figure 1] showed a tortuous tubular structure in the right lung field which was seen reaching till the right hilum superiorly. Possibility of an arteriovenous malformation or scimitar syndrome was kept. The patient underwent CTA of the chest for further evaluation. The scan was acquired dynamically with 100 ml of non ionic contrast with injection rate of 3.5 ml/sec using 2.5 mm slice thickness and a 0.75 mm reconstruction interval. The CTA showed it to be "meandering" tortuous right superior pulmonary vein [Figure 2]. The vein was coursing inferiorly and superiorly in the right lower lobe and then coursing posteriorly. It was not draining at the usual position of the right superior pulmonary vein. Instead, it was coursing posterior to the right main bronchus and was then draining into the left atrium in the region of the right inferior pulmonary vein. 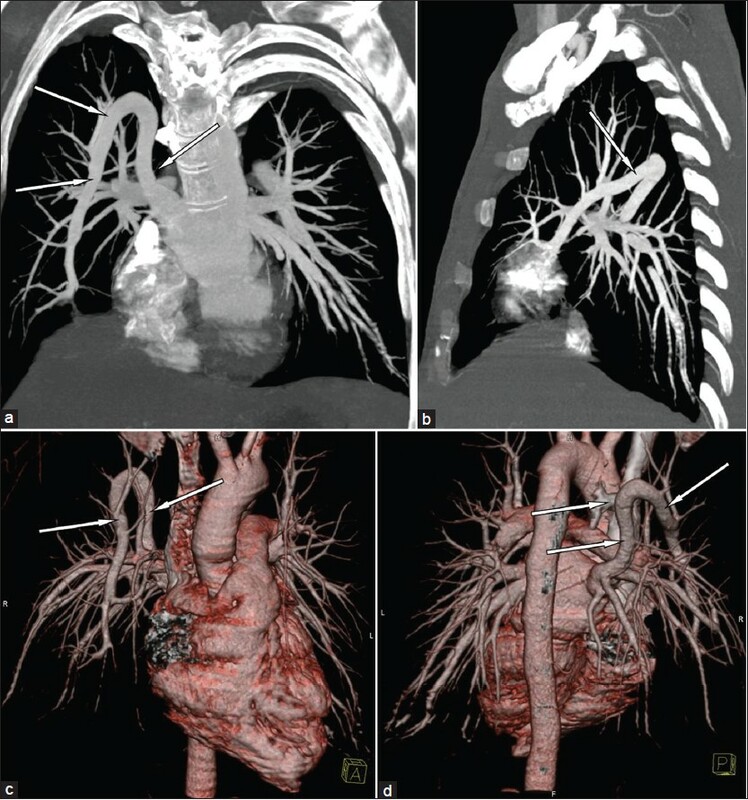 Volume rendered images (VRT), maximum intensity projection (MIP) and multiplanar reformatted images (MPR) were made to exactly delineate the course of this tortuous vessel [Figure 2]a-d. No arterial feeders to this vessel or any nidus was seen on CTA thus ruling out an arteriovenous malformation (AVM). There was no lung hypoplasia (scimitar syndrome). The bronchial anatomy and the situs were normal. It is very difficult to differentiate and diagnose anomalous tortuous pulmonary veins on chest radiograph. Usually, most of these lesions are falsely labeled as scimitar syndrome or arteriovenous malformations. The classification of congenital anomalies of pulmonary veins is complex and classified into three types (a), normal or abnormal course with anomalous pulmonary venous drainage, (b) no abnormal venous connection with anomalous pulmonary venous drainage, or (c) abnormal venous diameters. But, some of the conditions may fall into more than two categories. Unilateral anomalous pulmonary vein with hypogenetic lung had been described on computed tomography (CT). Multiplanar reconstructions of helical CT is used for diagnosing the cases of pulmonary vein abnormalities for establishing the diagnosis. , Many theories have been postulated regarding the abnormal course of pulmonary veins and it has been suggested that delayed union of the common pulmonary vein with the pulmonary venous plexus leading to connections with both the umbilical vitelline veins and the left atrium causes it. Meandering vein is thought to be due to persistence of left atrial connection with obliteration of the splanchnic connection. A meandering vein usually means an anomalous course of the vessel which may not be the sole draining vessel of the ipsilateral lung. Associated findings include hypoplasia of the right main pulmonary artery and lung hypoplasia. The scimitar syndrome also known as venolobar syndrome or hypogenetic lung syndrome comprises of partial anomalous pulmonary venous drainage of lung, lung hypoplasia and systemic arterial supply from aorta or one of its branches to the lung. , Scimitar syndrome is characterized by the following features: (a) lung hypoplasia (b) dextroposition of the heart, (c) hypoplasia of the right pulmonary artery, (d) anomalous arterial supply of the right lower lobe from the abdominal aorta (e) an anomalous right pulmonary vein connection to the systemic venous circulation either below or above the diaphragm most commonly to the inferior vena cava. It produces left to right shunt, which may be asymptomatic or can even lead to heart failure. The CTA is the investigation of choice for detecting the anomalous pulmonary venous connections and vascular lung lesions. , It is effective, fast, widely available and with isotropic voxel reconstructions of the arterial and venous supply of the lesion, which can be seen in great detail and in any plane after post processing at the work station. The MPR, MIP and VRT images are very helpful in depicting the vascular structures, as well as the blood supply of the lesions. If there is an AVM, the arterial feeder or nidus and the venous component can be easily seen and diagnosed. Earlier pulmonary angiography was the modality of choice for diagnosing this condition but now CTA is the single most important investigation for diagnosing such pathologies and has many advantages. It is non invasive, easy to perform, less time consuming and with lesser radiation exposure. Nowadays with advanced multislice CT scanners the studies are usually completed in less than a minute. This condition does not need any active intervention or surgery. In contrast, scimitar syndrome and arteriovenous malformation usually require surgery or embolization for treatment as they have an abnormal vascular shunt. Computed tomographic angiography (CTA) should be done in suspicious vascular lesions of the lung as it confirms the diagnosis along with excellent depiction of the anatomy using VRT, MPR and MIP images. We would also like to stress that the clinicians or surgeons should not try to operate or biopsy such lesions before doing CT of the patient as these vascular lesions can lead to life risking hemorrhages. 1. Husain AN, Hessel RG. Neonatal pulmonary hypoplasia: An autopsy study of 25 cases. Pediatr Pathol 1993;13:475-84. 2. Remy-Jardin M, Remy J. Spiral CT angiography of the pulmonary circulation. Radiology 1999;212:615-36. 3. Agarwal PP, Seely JM, Matzinger FR. MDCT of anomalous unilateral single pulmonary vein. AJR Am J Roentgenol 2004;183:1241-3. 4. Hidvegi RS, Lapin J. Anomalous bilateral single pulmonary vein demonstrated by 3-dimensional reconstruction of helical computed tomographic angiography: Case report. Can Assoc Radiol J 1998;49:262-5. 5. Konen E, Raviv-Zilka L, Cohen RA, Epelman M, Boger-Megiddo I, Bar-Ziv J, et al. Congenital pulmonary venolobar syndrome: Spectrum of helical CT findings with emphasis on computerized reformatting. Radiographics 2003;23:1175-84. 6. Gupta ML, Bagarhatta R, Sinha J. Scimitar syndrome: A rare disease with unusual presentation. Lung India 2009;26:26-9.